Goose Tracks quilt block is really a charming old pattern,for either a two or three color combination. Allow seams extra to the cutting sizes here given and a block will finish about 11 inches square. (enlarge pattern) This Goose Tracks quilt puts together with alternate white blocks, 6 blocks wide by 7 blocks long plus a 3-inch border and it finishes 72 by 83 inches. You will need 2 1/4 yards of blue material and 6 1/2 yards of white. Allow extra for seams on all blocks. 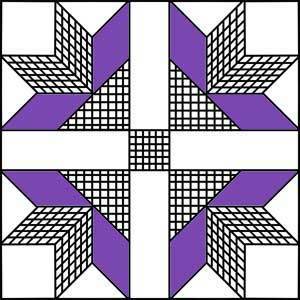 The Snowflakes design or a ten-inch Feather Circle would be suitable to quilt on the alternate blocks. Click on image to print the 5" block of the Goose Tracks Quilt Pattern.